Description: Following the Battle of Resaca, May 13-15, Gen.
Joseph E. Johnston’ s army retreated southward while Sherman pursued. 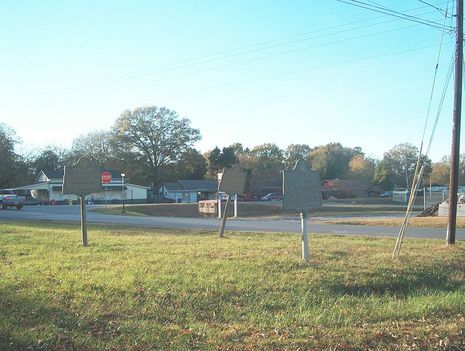 Failing to find a good defensive position south of Calhoun, Johnston continued to Adairsville while the Rebel cavalry fought a skillful rearguard action. On the 17th, skirmish fire continued throughout the day and into the early evening. Maj. Gen. O.O. Howard’s IV Corps ran into entrenched infantry of Lt. Gen. William J. Hardee’ s corps, while advancing, about two miles north of Adairsville. The 44th Illinois and 24th Wisconsin (under the command of Maj. Arthur MacArthur, father of Douglas) attacked Cheatham’s Division at Robert Saxon (the Octagon House) and incurred heavy losses. Three Union divisions prepared for battle, but Maj. Gen. George H. Thomas halted them due to the approach of darkness. Sherman then concentrated his men in the Adairsville area to attack Johnston the next day. Johnston had originally expected to find a valley at Adairsville of suitable width to deploy his men and anchor his line with the flanks on hills. The valley, however, was too wide, so Johnston disengaged and withdrew. 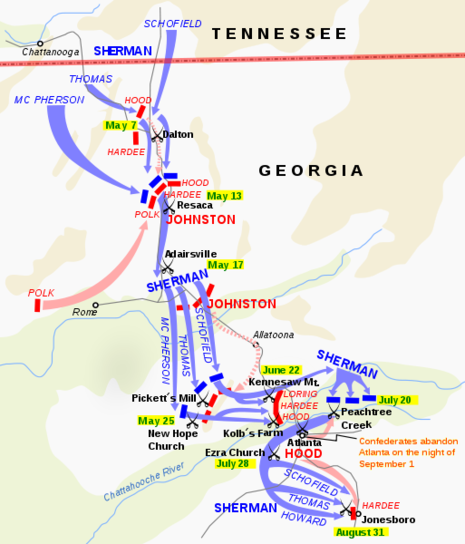 The Battle of Adairsville was a battle of the Atlanta Campaign fought during the American Civil War on May 17, 1864, just northeast of Rome, Georgia. The brief engagement was a Confederate delaying action that allowed General Joseph E. Johnston to bait a trap for the Union army at Cassville.